When I wrote about CanLit cynicism for carte blanche, I started with Alex Good’s book of essays, Revolutions (full Q&A here). Then, a very strange novel fell into my hands (actually, it was placed there by Kelsey at Freehand Books) and I knew these books were meant to be together. 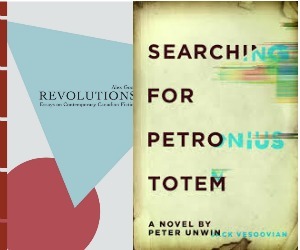 Searching for Petronius Totem is a strange, hilarious book, and author Peter Unwin is a bit strange and hilarious himself. Read on for the full Q&A. Many thanks to Mr. Unwin, and Ms. Attard at Freehand books! A few weeks ago, I reviewed Paper Teeth by Lauralyn Chow for Vue Weekly. You also have to limit the word count. That’s not something I do here on the blog. I love a long review. I had to keep my review of Paper Teeth under 800 words, and I had about 1,500 in my first draft. So, if you didn’t get enough of my ramblings in Vue, here’s a longer version, along with the full text of my Q&A with Lauralyn Chow. I loved this book, and if you’re into historical CanLit, especially Edmonton and Calgary settings, you’ll want to check this out.